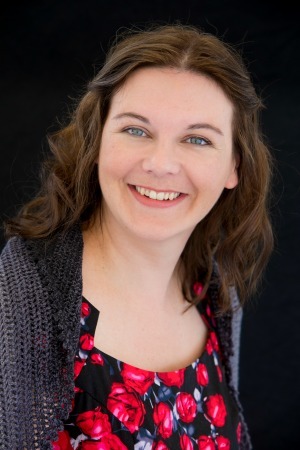 Jenny has been a very busy bee! 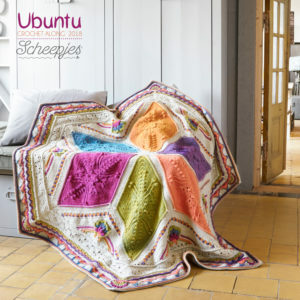 She has fallen head over heels in love with Scheepjes Whirl, and every time I see her, it feels like she has started another Whirl project. Of all the Whirl projects she has made so far, her Whirl Sophie is my favourite! It is just so bright and beautiful. 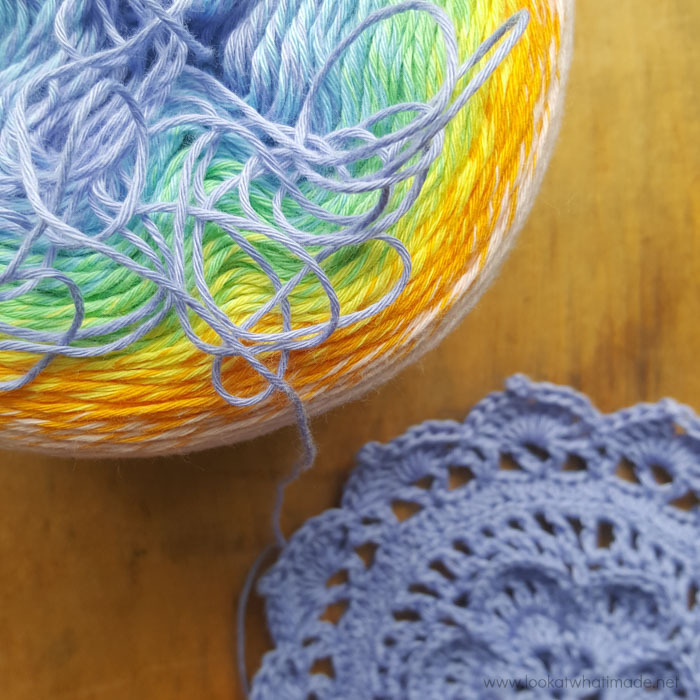 We know that a lot of people struggle with choosing colours for their Sophies, so using a long colour-change yarn like Whirl is perfect. 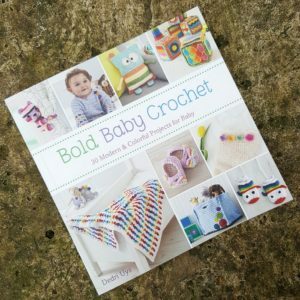 All you have to do is choose your colourway, and away you go without having to worry about which colour to use next. And if colour isn’t your thing, you can have a look at Jenny’s Single Colour Sophie HERE. If you would like to make a Sophie in Whirl, you will find all Jenny’s notes below. But first I want to show you some photos of how prettily the colour changes played together. What a happy coincidence that the leaves of the central flower turned out green. It makes the central flower look like a summer flower bed under a blue sky. And just look at that gorgeous orange corner flower! But my favourite part remains the roses!! If they weren’t so time-consuming, I would make a blanket just out of those roses. 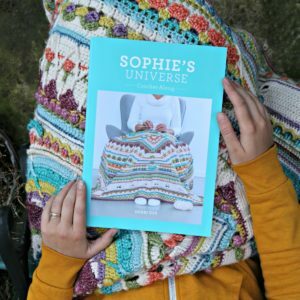 You can see more of Jenny’s Sophie photos on Instagram at #scheepjeswhirlsophie and on Ravelry HERE. 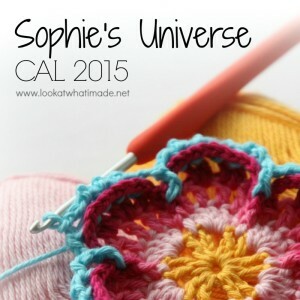 You can find the pattern for Sophie’s Universe HERE. 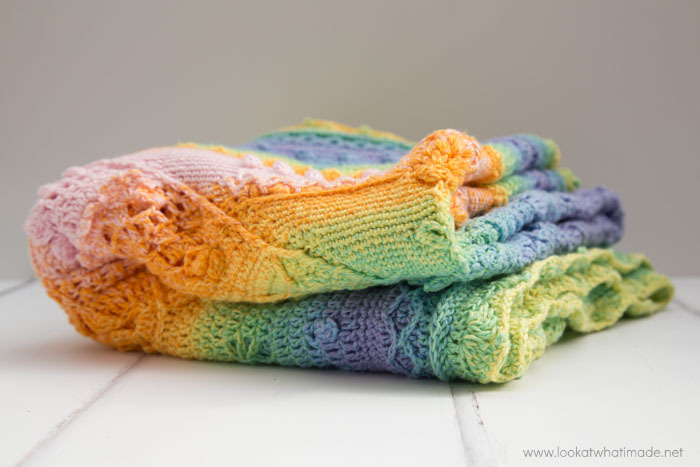 3 skeins of Whirl in the Cotton Candy Man (760) colourway (220g/1000m) – Available from Wool Warehouse, Deramores, and other Scheepjes Retailers. Your Sophie should measure 9.5 cm at the end of Part 1. Jenny makes her chains much tighter than I do, so on Round 65, she replaced the ch-2 spaces on the short sides with ch-3 spaces to give her Sophie a bit more elasticity and to help prevent bulging. This is not such a big issue if you are working with a yarn that has a little bit of ‘give’, but if you work with cotton (no elasticity), and your chains are much tighter than the rest of your work, you might run into the same problem. If you feel that Round 65 is too tight for the previous rounds (in other words, your Sophie bulges at the end of this round), please redo it and replace your ch-2 spaces with ch-3 spaces (short sides only). Jenny started with purple (inside of the yarn cake) and worked her way to the pink (outside of the yarn cake). When the first cake was done, she started on the outside of the next one and worked her way back to the centre (pink to purple). For the last cake, she started with purple again. For her next Whirl Sophie, Jenny is starting with a 2.75 mm hook, moving up to a 3 mm hook at the start of Part 4, and moving up to a 3.25 mm hook at the start of Part 8. 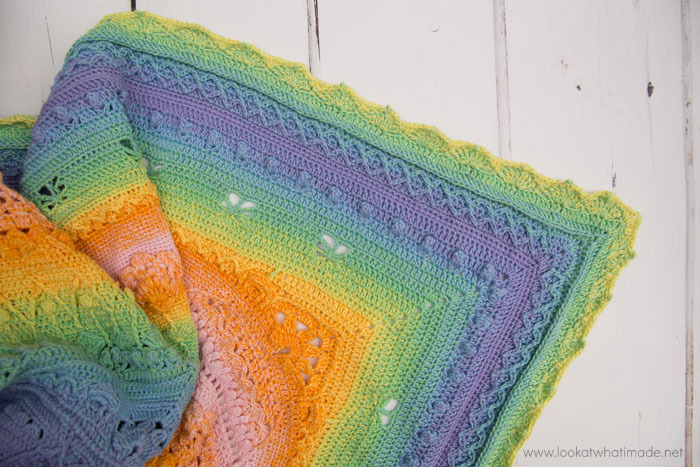 If you are a very loose crocheter, you might consider doing the same so that the last part of your blanket isn’t too ‘holey’. Photo taken by Jenny at The Arched House in Lyme Regis (June 2017 Devon Sun Yarns Retreat). When Jenny got to the end of Round 113, she didn’t want to stop. Partly because she just didn’t want to stop, and partly because she wanted to end on a pop of colour. She added three more rounds, which you can find below. At the end of Round 113, you should have 216 sts per side. Sl st in the next st and into the ch-2 space. (Ch 3, dc, ch 2, 2 dc) in the same ch-2 space. This is your first corner made. *Skip the first stitch, which will be hidden anyway. Dc in each of the remaining 215 sts. (2 dc, ch 2, 2 dc) in the next ch-2 corner space. * Repeat from * to * 3 more times, omitting the last corner on the last repeat. Join to the top of the beginning ch-3 with a sl st.
Stitch Count: 219 dc per side. Sl st in the next st and in the ch-2 space. (Ch 1, sc, ch 2, sc) in the same ch-2 space. This is your first corner made. Sc in the first two sts. *(Skip the next 3 sts. Make 4 tr in the next st. Ch 3 and sl st into the third ch from your hook. 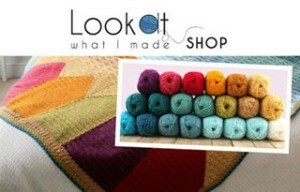 This is your Picot made. Make 4 tr in the next st. Skip the next 3 sts and sc in the next st) 24 times. Sc in the last st. (Sc, ch 2, sc) in the next ch-2 corner space. * Repeat from * to * 3 more times, omitting the last corner on the last repeat. 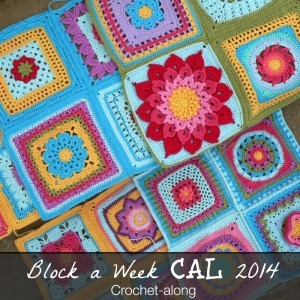 Join to the first sc with a sl st.
Stitch Count: 29 sc, 192 tr, and 24 Picots per side. Repeat from * to * 3 more times, omitting the last corner on the last repeat. Join to the top of the beg ch-3 with a sl st. Fasten off and work away your ends. Stitch Count: 144 sc, 48 hdc, 33 dc, and 24 ch-2 spaces per side (not including corner ch-2 sps). 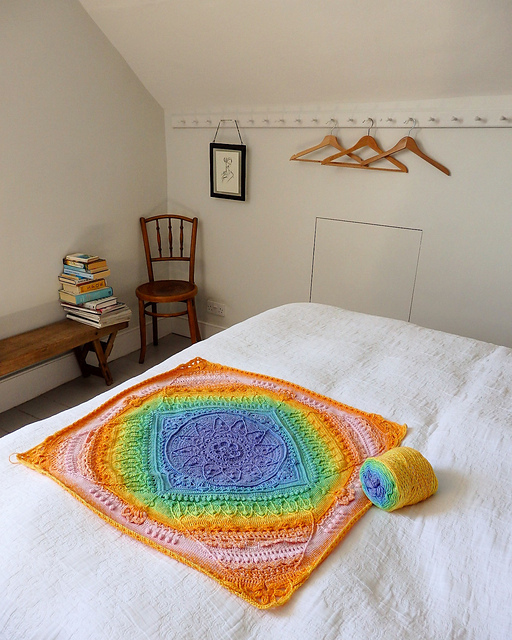 …and here is a photo Jenny took of the entire blanket. Isn’t it gorgeous? 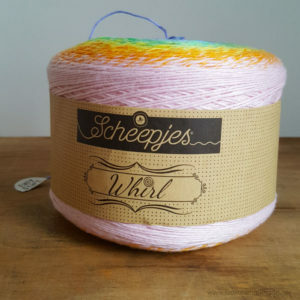 We would love to see your Whirl Sophies, so if you have made one (or will be making one), please use #scheepjeswhirlsophie so that we can see your photos. 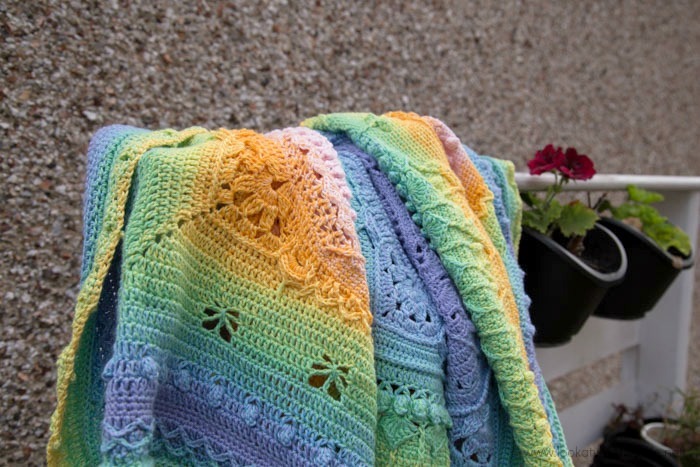 If you want to try the yarn on something a little less adventurous, please have a look at the ‘My Story Shawl‘, which is also made with Whirl. Ooh, before I go, I have just finished my first Instagram Party where I shared a 15-round Mandala as a photo tutorial. The pattern is by my friend John Kelly and will be available on my website soon. In the meantime, you can still join the party over on Instagram! Just scroll down on my feed until you see the photo that says #notacal and work your way up from there. 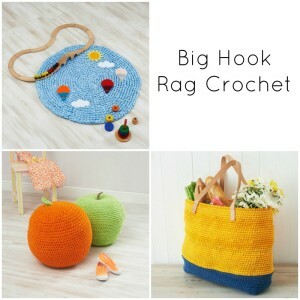 Thanks Jenny as I am not going to crochet it for myself I have got to consider the fact that yellowish colours is not het favourite. Thanks for the advise. Hi Jenny, I also bought the Cotton Candy but would like to skip the Yellow/Orange. 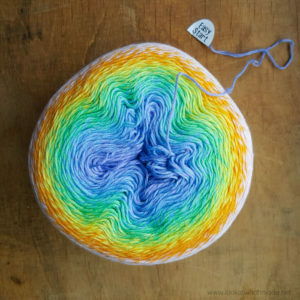 What yarn will your recommend to use with the Whirl. Hello Maryna. I must admit to loving the orange and yellow in the Cotton Candy Man Whirl, but maybe have a look at the Whirlette in 852 Frosted, which is a lovely delicate silver grey? That shade would compliment the remaining colours pretty well, but would interrupt the smooth flowing colour changes a bit. 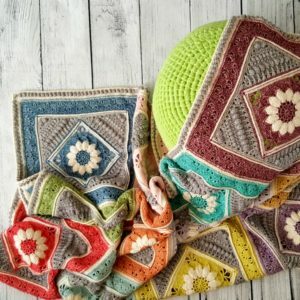 I have just finished Sophie’s universe which is my first project. It took 5 months and had brought me endless joy throughout the journey. Your instructions were clear and easy to follow. I cannot bear to part with it as a gift. 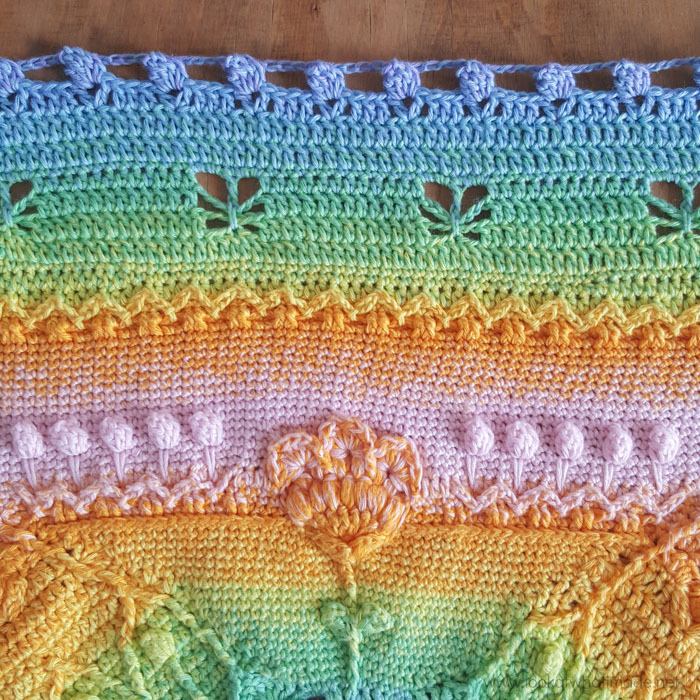 And now you have provided me with a great colourway for my second sophie as a gift! Perfect! Hi! This is beautiful. Can you let me know what the final dimensions are (including Jenny’s border, which is also very pretty). How much of the whirl was left? Hi Malika. 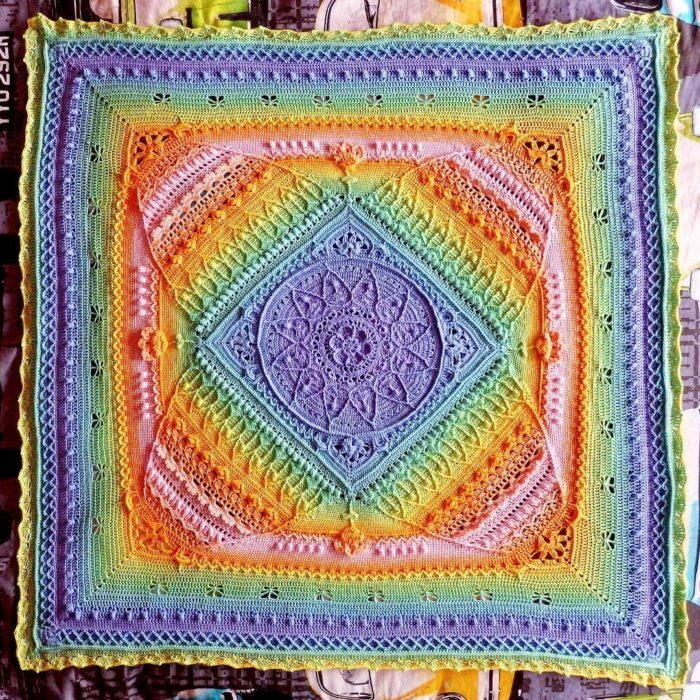 My Whirling Sophie is 95cm square after round 113 and 99cm with the border added. 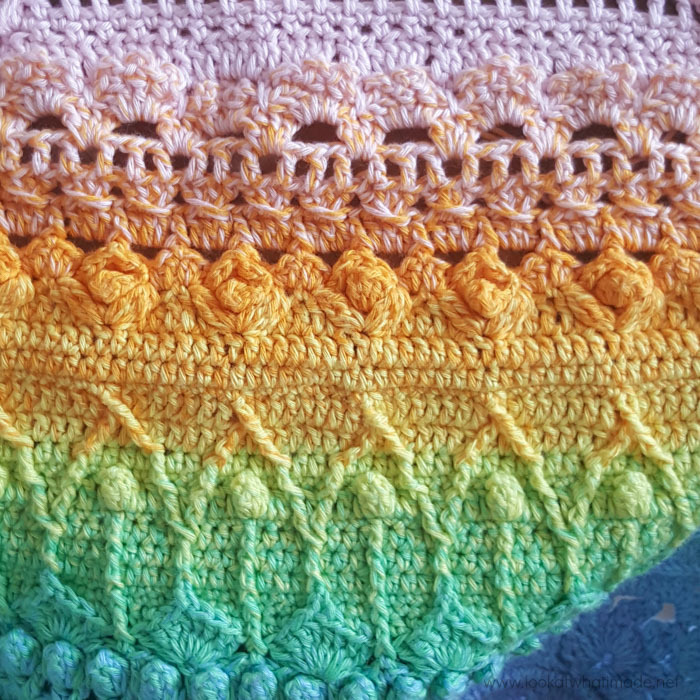 I’m so excited…I had wanted to start one awhile back thinking i would use the Caron Cakes when they first came out but never got around to it…I’ve been buying whirls because i love the colors so much and now just started the Sophies with the whirl and am loving the color and feel! I’m using the Rhubarb Bumble and it’s so pretty! i just finished part 3 but didnt have a 3mm hook. I have a 2.75 and a 3.25, 3.5 but you had mentioned that the 3.5 left it a little holy…is it better with using the 3mm and then 3.25? If you are starting with a 2.75, I would use a 3 and then a 3.25. Otherwise, make the first 7 parts in a 2.75 and then go up to the 3.25? Good luck! Looks really different doesn’t it? But still pretty, looks like Easter. I think this is lovely – both design and colours used. 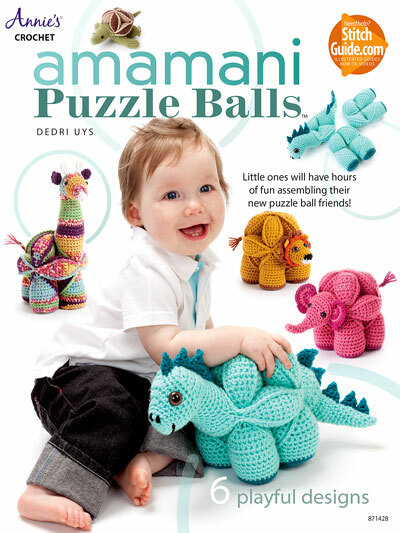 As I would not say that I am an ‘expert’ at crocheting, just how difficult is this pattern? 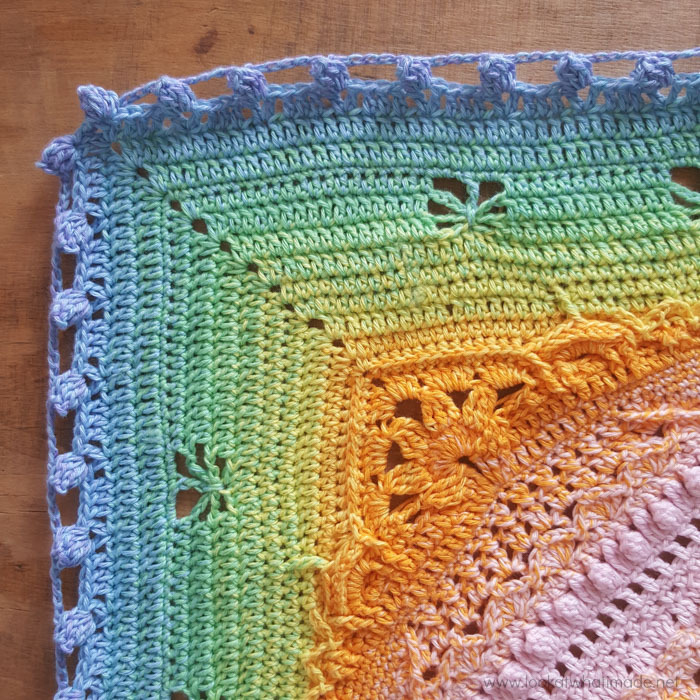 This is one of the most beautiful Sophie’s I’ve seen! So gorgeous! Jenny will be very pleased to hear that!